Clavicus Vile is the Daedric Prince of wishes, typically depicted as a small, jovial man with horns protruding from his head. His companion, Barbas, is usually shown as a dog, but his form can vary; in Skyrim, Barbas is present in his dog form. 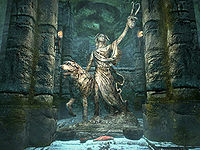 Clavicus Vile's shrine in Skyrim is located at the end of Haemar's Shame, a cavern that is home to vampires that worship him. 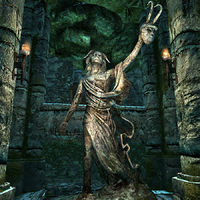 Vile's statue shows him holding his artifact, the Masque of Clavicus Vile. At the beginning of the related quest, Barbas will be absent from the statue due to taking on a living form. The choices made during the quest determine whether or not Barbas returns to his master's side. Barbas offers much information about Clavicus Vile, both on his strength and their connection: "My master and I had a bit of a falling out. We got into an argument and it got rather... heated. He's kicked me out until I find someone who can settle our disagreement. That's where you come in." If you agree to help him out, he will reply, "Thank you. Now, since he banished me, Vile's been rather weak. He can't manifest very far from one of his shrines." The Daedric Prince later confirms this himself. Clavicus Vile is also not always keen on keeping the deals he makes. Despite his power being linked to Barbas, Clavicus Vile is certainly not fond of him, willing to not only banish him from the shrine but to order his death, something that not even Barbas expected. He appears to be fond of creating new twists on the deals he makes, saying that "I'd simply snap my fingers, and everyone in Skyrim would die. War resolved." if you ask him to put an end to the civil war. Another instance of this happened much earlier to a man named Sebastian Lort, who wished for a cure for his daughter's lycanthropy and was given the Rueful Axe in response. "I'm just here to reunite you with Barbas." "Ugh. That insufferable pup? Forget it. Request denied. No deal. I'm glad to be rid of him. Even if it does mean I'm stuck in this pitiful shrine, in the back end of... nowhere. Well... perhaps there is a way he could earn his place back at my side. Maybe. But no promises." "An end to the civil war that plagues my land." "Oh, if I had my full power, granting that would be trivial. I'd simply snap my fingers, and everyone in Skyrim would die. War resolved." "The power to crush all before me!" Additionally, choosing the last two options will have him continue, "As much as I hate to say it, you're almost as powerful as I am right now. But that's just because half of my power resides in that mutt, Barbas. Come to think of it, I know of a win-win situation for both of us." Whichever option you chose, you can now ask him what the offer is. He will respond, "There's an axe. An incredibly powerful axe. An axe powerful enough for me to have quite a bit of fun, indeed. If you bring it to me, I'll grant you my boon. No strings attached. No messy surprises. At least, not for you. As I recall, it's resting in Rimerock Burrow. Barbas can lead you right to it. The little mutt might even earn his place back at my side." If you again ask him what he wanted, he will summarize, "In Rimerock Burrow, there's an artifact called the Rueful Axe. Bring it to me, and I'll take Barbas back. Simple as that." "I sure would like to keep this axe..."
"And I could absorb the spirit of poor, dead Barbas. He'd still be reunited with me. And I'm sure Barbas doesn't want me to have that axe. He'd want it this way. The choice is yours, friend. We're all counting on you to make the right decision. Put him out of our misery!" "No deal. Take the axe and take back Barbas!" "Hrmph. You're no fun at all. Guess I'll have to make my own fun elsewhere. And with the pup back, I'll be restored to my full power. There's a whole world just waiting for me!" Barbas will interject, saying, "Wait a second, there's another option here." If asked, he will speak of an alternate reward for refusing: the Masque of Clavicus Vile. You can also walk away to think it over first, and telling Clavicus this will have him ask, "And?" Either way, you have to choose between killing Barbas or sparing him. If you state that you'll keep the axe, you can still change your mind and spare Barbas. However, you cannot reverse your decision if you hand the axe over. If you kill Barbas, ask Clavicus if you're done here. He will seem satisfied with the outcome: "Absolutely! Now I can reabsorb his body, and return to full power. All without having to listen to his whining. Oh, sure, he'll be back in a century or two, but think of the fun I can have 'til then." He'll wish you to "Enjoy that axe! And don't worry about poor old Barbas. After all, he really should have picked a better friend...", his voice disappearing afterwards. Barbas: "I knew I could trust you!" Clavicus: "Yeah, yeah, dog gets master, master gets cosmic axe, everyone's happy. Just get over here, mutt." Barbas: "Don't worry. I'll make sure he sees the light. I trusted you, now you trust me." Clavicus: "You're worth putting in the extra effort for, pooch." As Barbas turns into stone, Clavicus will then remark, "Ah, that feels so much better! You forget how nice supreme power feels until you've been stuck in a cave for a few years." What he says after depends on your dialogue earlier: if you only wanted to reunite him and Barbas, he will continue, "It's a shame you wished for something so dull as me taking back the mutt. Quite the lack of imagination on your part. A lack of ambition like that really ought to be punished. Perhaps by turning you into a worm, or maybe a few decades of..." If your wish was for the civil war to end, he will instead say, "Now, as for your wish... An end to the war, was it? I'll make sure this war ends, all right. Just as soon as the dragons swarm across Skyrim and wipe out all of you puny..." Alternatively, if you wished for power, he will tell you, "Now, as for your wish... Power, was it? You can be a part of a tremendous power - all you have to do is let your soul be absorbed by this axe. I never said it would be your power..." Either way, he will fortunately change his mind, dismissing you with "Oh, fine. Have my boon and be done with it. I've got more interesting deals to make, anyway." and leaving you with the Masque of Clavicus Vile. Before you set out to retrieve the Rueful Axe, he would have said, "Collect the Rueful Axe from Rimerock Burrow, and I believe we'll have a deal." If Barbas is dead, he would have commented, "It's nice to be rid of that detestable dog. Things are so much more fun without his incessant preaching." His other greetings include "Ah, there you are. I've been waiting for you to arrive." and "You have business with Clavicus Vile?" If Barbas lives, Clavicus would have said, "And I was so close to being rid of you." Later on, you could have activated his shrine to comment, "I see he's having a good influence on you." and he would have replied in frustration: "Yeah, rub it in. Just imagine what I could get done with my full power and none of these pesky 'morals.' Still, I've got this axe, and even if I can't use it, I'm sure someone would make a deal for it. Maybe I'll have a word with Molag Bal..." However, activating his shrine after the quest does nothing. This page was last modified on 8 September 2014, at 19:41.